At the FCT AGM last night it was announced that the 2010 Easter Show will be ‘Just So’ by ‘Honk’ creators Anthony Drewe and George Styles. You can read much more about the show here. The show will take place from 14 – 17th April and be performed at St Brides Centre, Gorgie. Cameron Dyer will make his Directorial Debut. Already, work has been underway and plans are looking very exciting! 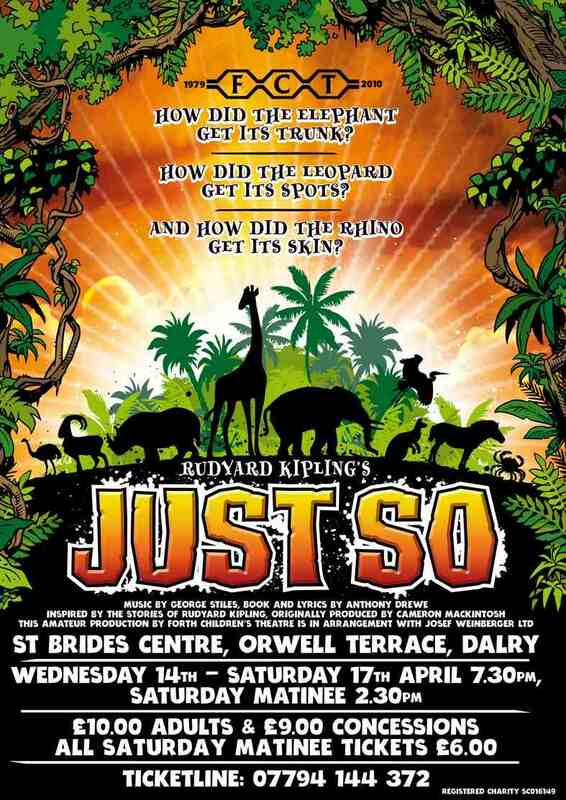 Set to an eclectic, upbeat score, Kipling’s “Just So Stories” are woven with wit and imagination into a song-filled journey through the jungle. This show provides an excellent mix of characters, giving opportunity to all ages. Auditions are being held on Wednesday 23rd December at Trinity Academicals Rugby Club, Craighall Gardens from 1000 – 1600. Please wear comfortable clothing and shoes that are suitable for doing movement in. It is also advised to bring a packed lunch as there may not be time to go to the shops. The day will take the format of morning workshops followed by small group auditions in front of the directing team. It will be a brilliant experience and involve lots of fun, dancing and meeting new people. All material will be learnt in the morning so there is no need to prepare anything in advance. Please be prepared to stay until 1600 although there is chance you may be able to leave before depending on when each group is seen. Rehearsals are due to start on Friday 8th January 1830 – 2100. Rehearsals will be held on a Friday evening and a Sunday afternoon, although some principals may be called for occassional rehearsal on a Wednesday evening. At the FCT AGM last night a new committee was elected which involved a close tussle for power between Chris Park (the victor) and Fifi Doig (the unfortunate but delightful runner up). After eight long years current Chairperson Margaret McPherson made an emotional valedictory speech pointing out that she had left on an all time high and thanking FCT for its support for her personally in this very difficult year for her and the family as Jack passed away during the summer. FCT is utterly indebted to Margaret and cannot find words to thank her for her astounding efforts and subtle management over the last decade. The new chairman, duly elected, is Mark Gorman who takes up his post following two years on the fundraising and finance committee. Mark was also Chair about 20 years ago. Liam Sinclair was re-elected for a further three years, Jane Sutherland for one year and joining the committee is Chris Park and, in a new role, Kirsty Harrower, who is the new parent member; there to represent the views of current cast members. Her son Angus played Little Boy in Ragtime. And as it happens Mark’s daughter, Ria, is also a current cast member.